HA Acoustics undertake accredited sound insulation testing nationwide. We test in accordance with BS EN ISO 140 and the Building Regulations Approved Document E – ‘Resistance to the Passage of Sound’. HA Acoustics offer both pre-completion testing and sound insulation testing, enabling your construction project to meet national sound insulation standards. We test the internal acoustic performance of separating floors and walls. Our sound insulation test reports are laid out in a standard, easy to read format, ensuring your Local Authority (council) or private building control officer with all necessary information. We’re able to offer a professional service, at a competitive price, with quick and reliable turnaround. Sound Insulation testing is required for all new dwellings constructed in England and Wales, or any residential conversion that creates two adjoining residential dwellings. Our professional, robust sound insulation testing protocols comply with Part E of the Building Regulations for England and Wales. Sound Insulation testing is required to make sure that separating partition walls/floors within a residential development demonstrate acceptable levels of noise reduction. Where applicable, our Sound Insulation testing service covers both airborne sound (i.e. noise transmitted through the air, such as a heated conversation between a couple) and impact noise (i.e. noise resulting from an impact on the floor surface, such as high heel footsteps, washing machines and chair scrapes). Our Sound Insulation testing service assesses if the newly constructed dwelling, or change of use from a former building (i.e. a mill or pub to flats) is sufficiently constructed to ensure the new dwellings provide a reasonable resistance to the passage of sound. Engaging HA Acoustics enables your construction project to benefit from our years of experience, this means that your project will be expertly dealt with from start to finish by our expert team of acoustic consultants and technicians. 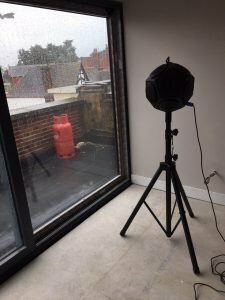 Sound Insulation Testing, or Sound Testing as it’s sometime called, is a method of testing a Party Floor or Party Wall structure to determine its acoustic performance in accordance with recognised British Standards as set out within Building Regulations Approved Document E.
Part E requires that various separating partitions (i.e. party walls and floors) are tested between adjoining dwellings. Dependent on the size and layout of the property, depends on the exact number of walls and floors that will be required to be tested. However, as a rule of thumb, a development of 10 dwellings with similar construction materials and methods, would typically require sound testing that includes 2 airborne wall tests, 2 airborne floor tests and 2 impact floor tests. 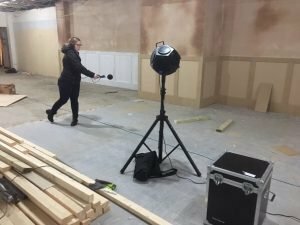 HA Acoustics carry out sound tests throughout the UK, please drop us an email or telephone our office, where one of our consultants or technicians shall be able to talk through your project and assist.